The Dodgers had lost the previous three games to the suddenly mighty Pirates. Scott Kazmir – or as I call him, “Ol’ Back, Back, Back” – went to the mound, and manager Dave Roberts used his “all righty” lineup in an attempt to avoid the sweep. 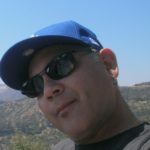 Your loyal writer wears a thick coat of Dodger blue optimism, but today’s chances did not look good. Things to watch: Chris Taylor, newly acquired in the trade for Zach Lee, got the start at SS. Yasiel Puig batting clean up. Normally, I like this move, but Puig has been cold lately. 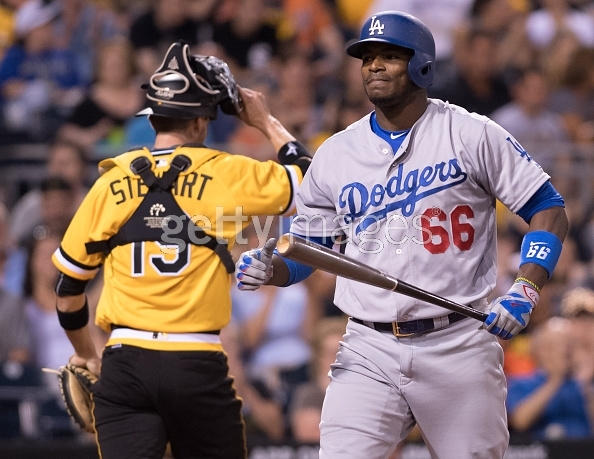 The Dodgers were going to need Puig’s bat to avoid the Pittsburgh brooms. Quickly it was bases loaded and one out. Chris Taylor hit a triple in his first Dodgers at bat. Kazmir had settled down. Ten in a row retired. Enrique Hernandez walked (his third walk of the day). He went to third on The Red Chia Pet’s double. Trayce Thompson (0 for 17) walked to load the bases with one out. Kazmir got out of a two on-two out jam to preserve the Dodgers’ lead. Kazmir out, Louis Coleman in for two outs. Then Roberts went to J.P. Howell with the tying run on second. Job done. Joe Blanton in. Job done. Pedro Baez in. He got two out on pretty easy strike outs, and Roberts went to Kenley Jansen. Job done. The boys got two on with no out. Scored none, and Puig was hit on the arm with a pitch. Scott Kazmir started out with two pitches – way off the plate, or right over the middle. Most were way off the plate. He eventually settled down and at one point he retired 12 in a row. After that lousy first inning, the Pirates never again scored off him. Bright sides: The Dodgers offense- with Yasiel Puig at clean up – came up big time today to overcome 4-0 deficit. The bullpen combined to pitch four scoreless innings and preserve the win. Jansen got the four-out save. Uh-oh File: Puig got hit hard on the elbow in the ninth. We’ll have to watch developments on that. Justin Turner ended the game limping around, so that’s another something. Reports after the game said JT only had a cramp. It’s Up To Scott Kazmir To Prevent The Dodgers From Being Swept……LOL! I heard that Steward was starting the game on Wed! I hope Turner is ok. I listen to Dodger talk, and watched the post game show, and they didn’t mention Turner, but Turner’s last swing didn’t look good, and he was taking out of the game. It’s Stewart and he’s a “strike throwing machine”. Ok. If so, that will be different. What’s this about Kershaw’s back? And something about Turner? Need details. A few days ago I asked “who’s next”? You know it’s going to be somebody soon and somebody else soon after. Stewart started in Rancho this year. Turner twisted his knee or something, and you could tell with his last swing, that he didn’t feel great. I just hope he is ok.
Rick Monday brought up a point that many here will agree with: Seager is not getting enough ABs with runners in scoring position. Why not bat him third and Turner cleanup? I agree. Agone should be batting 5th. Move Kendrick or Puig into the #2 spot. I have felt Seager should be hitting #3 all year, but the problem is nobody gets on ahead of him.